It’s playoff time again, which means it’s also time for our Breaking It Down series. That’s where I – and I alone – take a look at the post-season matchups and provide is a snapshot of the action to come. 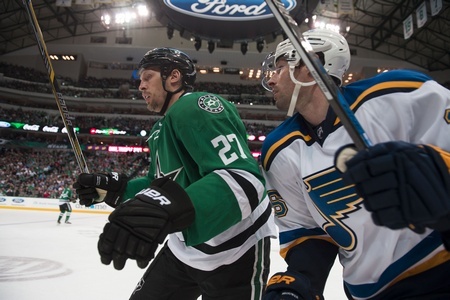 This edition features a look at the second round matchup between the St. Louis Blues and the Dallas Stars. Game One is on Friday. The Blues and Stars last met in the post-season way back in 2001, when St. Louis swept Dallas out of the second round in four games. This time around, things are different – to say the least. The Stars and Blues have supplanted the Los Angeles Kings and Chicago Blackhawks as rulers of the roost in the Western Conference, with the Blues taking out the Blackhawks in the first round. Regardless of all the inane chatter about “big hockey markets” out of the picture, the Blues and Stars have the opportunity to show that they count in today’s National Hockey League. They met five times in the regular season, with St. Louis winning four of the five. Two games went to overtime; one went to the shootout. Brian Elliot did well against the Blackhawks, stopping 236 of 254 shots. He posted a 2.40 goals against average and a .929 save percentage, with one shutout. In six of the seven games, he topped out with 30 or more saves. He’ll face perhaps even more shots with the run-and-gun Stars, but one has to expect the 31-year-old from Newmarket will be up to the task. The Stars went with a split performance by Antti Niemi and Kari Lehtonen in the regular season, but Lehtonen got the nod in the post-season for four of the six games. The 32-year-old from Helsinki was 3-1 with a 2.27 goals against average and a .911 save percentage, while the 32-year-old from Vantaa was 1-1 with a 3.36 goals against average and a .870 save percentage. Look for Lehtonen to once again receive the majority of starts. The Stars roll out six defencemen and like to play a balanced game from their own end, but it’s safe to say the blueline isn’t their biggest strength. Alex Goligoski had three points in six games, including two points in the last two games. Kris Russell missed a game due to illness, but he still piled up quality ice time and landed with two points in five games. And John Klingberg had three points, all while playing serious minutes. St. Louis has been getting some brilliant hockey out of Alex Pietrangelo, who posted six points in seven games and floats around 30 minutes a game. He was tied for second on the team in scoring and he was a big part of the plan to shut down the likes of Jonathan Toews. Kevin Shattenkirk managed four points in seven games, but he was prone to some lapses with rookie Colton Parayko. When the Blues shuffled him back to pairing with Joel Edmundson, Shattenkirk picked things up. Jaden Schwartz led the offensive charge with seven points in seven games. He proved himself as the cornerstone of the “STL line,” with Vladimir Tarasenko and Jori Lehtera fleshing things out. The unit had 17 points in the series, with Tarasenko good for four goals. The 24-year-old Russian will benefit from more ice time, of course, but there may be some issues there. With Tyler Seguin’s status still unclear for the second round, the Stars have made it work with a deep roster of effective forwards. Jason Spezza had nine points, while Patrick Eaves, Patrick Sharp and Cody Eakin all contributed as well. Even Ales Hemsky had three points, with Mattias Janmark also picking up three assists in five games. The Stars and Blues have no issues with scoring, to say the least. Dallas ran its power play at a 21.4 percent effectiveness rating, which could give St. Louis some trouble. They stumbled against the Blackhawks and allowed Chicago to go six for 19 on the man-advantage. The good news is that St. Louis’ power play was also on-point, which suggests that both teams will need to be careful when it comes to avoiding the penalty box. This series should be a close one. While Dallas is prone to some slow starts and some blown leads, they still have the depth to pull through adversity. But uncertainty in the crease could still be an issue, which could give the more controlled Blues an advantage. If St. Louis can wear down the Stars’ defence, they’ll pull out the victory. With these considerations in mind, I’m giving St. Louis the series win in six games.